As anyone who follows the Hugo Awards will already be aware, the 2016 ballot was decided in large part by one man: Vox Day. As part of his Rabid Puppies campaign, the self-styled “national libertarian” provocateur sent his followers to vote for a slate that he himself assembled. The Rabid Puppies also affected last year’s Hugos; the campaign was in turn inspired by the less extreme Sad Puppies, which began in 2013. But previously, neither movement showed much interest in comics. Before 2016, the Sad and Rabid slates contained just two Best Graphic Story entries between them, both webcomics: Howard Tayler’s Schlock Mercenary and Carter Reid’s The Zombie Nation. 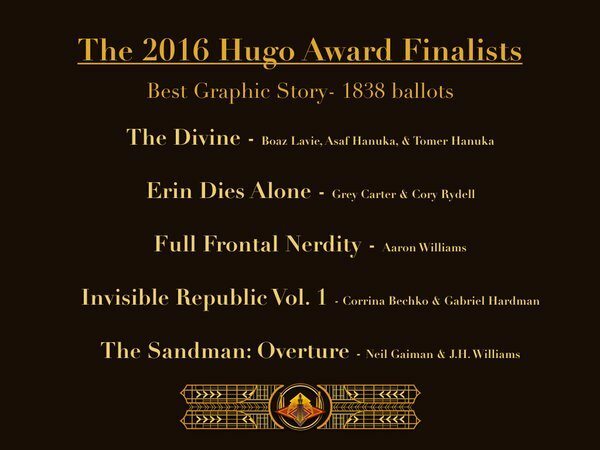 Things changed this year, as Best Graphic Story is one of four Hugo categories to be dominated entirely by Vox Day’s choices. In 2015, the Worldcon voters reacted to the Puppies by placing almost every slated finalist beneath the “No Award” option. When assembling his 2016 slate, Vox Day preempted this response by including a few popular choices that would likely have been nominated anyway. These include Andy Weir for Best New Writer, The Martian for Best Dramatic Presentation (Long Form), and File 770 for Best Fanzine. Such picks have been dubbed “human shields” by commentators, as Day was presumably intending to leave his opponents with a dilemma. Should they vote for these nominees, as they would have done ordinarily, and thereby, allow the Rabid slate to “win?” Or should they continue to place the Puppy picks below No Award, even if it meant depriving their favoured nominees of victory? In Best Graphic Story, the human shield was clearly The Sandman: Overture by Neil Gaiman and J. H. Williams III. After all, Gaiman had already won four Hugo Awards, and the return of his most iconic creation was not something that Worldcon’s voting base would pass by. But with the book nominated on the back of the Rabid Puppies campaign, some of Gaiman’s admirers expressed hope that, having previously won the award multiple times, he would withdraw the nomination and allow a non-Rabid candidate to take his place on the ballot. 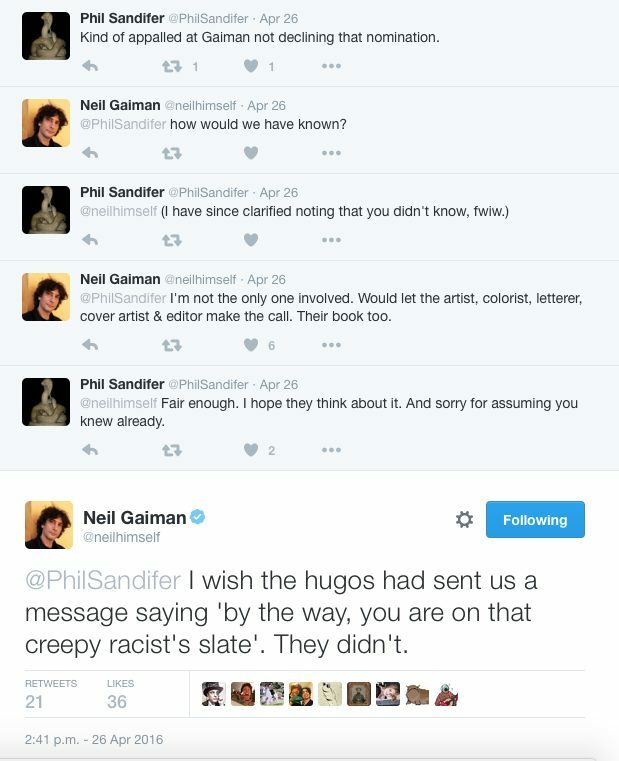 Gaiman expressed resentment at being on “that creepy racist’s slate,” but stressed that The Sandman: Overture was a collaborative work and, consequently, not his to withdraw. 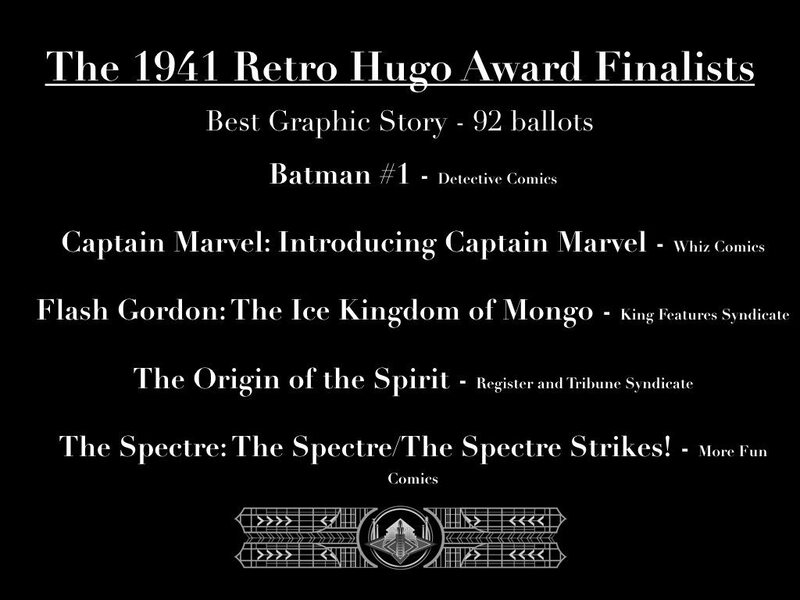 The ballot includes two other graphic novels. One of these is Invisible Republic Volume 1 by writer-artist Gabriel Hardman, co-writer Corinna Bechko, and colourist Jordan Boyd. A twenty-ninth century journalist explores the remains of a failed dictatorship and a future so run-down that it resembles the present. He comes across a journal that once belonged to Maia Reveron, cousin of the former dictator Arthur McBride. The story then splits into two branches: one follows the reporter as mysterious pursuers try to obtain the journal from him, while the other follows Maia Reveron as she witnesses her cousin transform from fugitive to Che Guevara-like icon. Invisible Republic Volume 1 collects the first five issues of the series. Taken together, these cannot be said to constitute a complete narrative arc—the mystery story still has more questions than answers at the volume’s end—but they certainly make for a promising start. 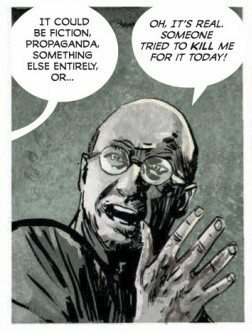 Between its stark, noir-inflected artwork and a gripping storyline about the nature of revolution, Invisible Republic is very much a series to keep an eye on. 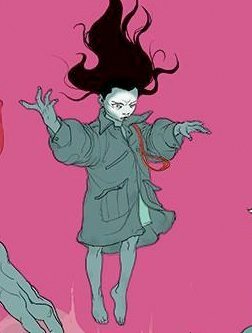 The last of the three graphic novels on the ballot is The Divine by writer Boaz Lavie and artists Asaf and Tomer Hanuka. The story was inspired by a photograph taken in Thailand in 2000, showing a pair of child soldiers: twelve-year-old twins Johnny and Luther Htoo, one weary-faced, the other smoking a cigarette. Leading the God’s Army guerrilla organisation on the border between Thailand and Burma, the two children gave rise to a set of local legends alleging that they had supernatural powers. The Divine’s treatment of these legends follows the general template of Joseph Conrad’s Heart of Darkness and Francis Ford Coppola’s Apocalypse Now, accompanying a Western traveler on his journey to an exotic land of mystery and horror, which causes him to have second thoughts about his own culture. The protagonist, Mark, is an American explosives expert who accepts a risky job in the fictional Southeast Asian nation of Quanlom so that he can afford better prospects for his newly-pregnant wife. While there, he encounters the Divine: a pair of nine-year-old twins who resemble a cross between the Htoo brothers and the parchment-faced children from Katsuhiro Otomo’s Akira. Mark learns that the operation was not as humane as he had assumed and stands alongside the two children as they use magic to defend their homeland. Boaz Levie’s straightforward story of magical Asians fighting macho bigoted Americans is brought to life by the Hanuka brothers’ artwork. The characters are well-observed, the Southeast Asian backgrounds convincing, and the occasional forays into body horror (again recalling Akira) suitably jolting. 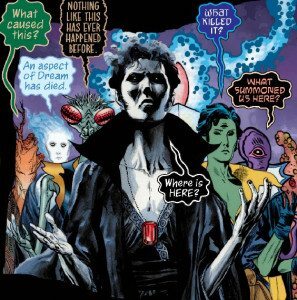 Most striking of all is the comic’s colouring: the palettes are kept generally muted, but with sudden splashes of brighter hues for punctuation, particularly during the supernatural scenes. The results are thoroughly effective. 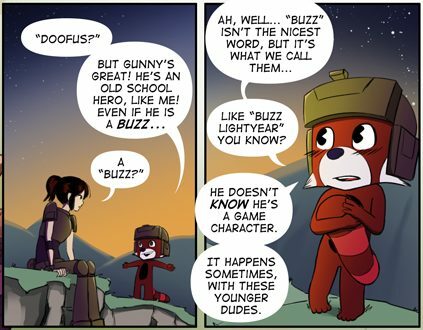 Full Frontal Nerdity is a geek-humour strip in the vein of Penny Arcade, with a general emphasis on roleplaying. I will have to admit that this genre has never been my bag, and Nerdity does nothing to convert me. 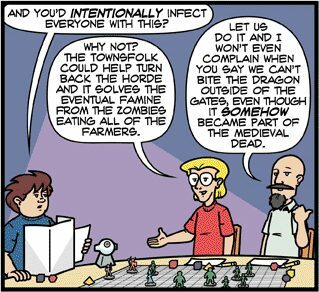 An in-depth familiarity with roleplaying seems necessary to understand the build-up of most strips, let alone the punchline, while the dialogue is decidedly long-winded. Brevity is vital to a three-panel gag-strip, and there is little space for sentences like “I was in California, beta-testing the new theme park attraction based on the Mass Effect video games.” That said, given that Full Frontal Nerdity maintains a loyal enough audience to have been running regularly since 2003, it seems to have hit the spot within its target demographic. Erin Dies Alone is more interesting. It stars a lonely young woman who is suddenly joined in her run-down flat by Rad Panda, a Sonic-like character from a video game she played as a child. As the protagonists segue in and out of game-worlds, the strip spoofs popular franchises such as Halo and Final Fantasy while also probing the clearly troubled mental state of its heroine. The comedy in Erin Dies Alone once again comes from the tradition of the geek humour strip, but the surrounding story is adds a little more psychological depth than is typical for the genre. The result is worth a look, although I am not sure that I would not call it award-worthy. As the above ballot indicates, comic readers of 1941 had a vintage year to look back upon. The first issue of Batman had hit the newsstands, while three other long-lasting heroes—Captain Marvel, the Spirit, and the Spectre—each made their debut. 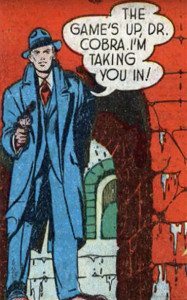 Meanwhile, Flash Gordon (still drawn by his original creator, Alex Raymond) was exploring the Ice Kingdom of Mongo. Each of these characters maintains an enduring appeal among comic fans, and the amount of mud-flinging and dirty tricks that surround this year’s Hugo Awards should remind us why. Note: An earlier version of this article incorrectly stated that The Zombie Nation was the only comic to appear on a puppy list prior to 2016; in fact, it shares this honour with Schlock Mercenary. This error has since been fixed.